don't get caught: Are you playing the visual winter games on your social feeds? Are you playing the visual winter games on your social feeds? One smart and easy way to maximize engagement with your social media visuals involves nothing more than looking out the window, or at least, at your calendar app. I'm talking about what you might call, right now, the winter games--at least where I live, in the grip of the polar vortex. Visuals, both photos and video, have long been far and away the strongest trend in social media. So it's still surprising to me that so many companies and organizations fail to maximize engagement by reflecting what we (and our followers) see around us. Your social audience is no different from any other audience in responding to the basic needs of humankind, expressed in Maslow's hierarchy of needs, in which food, clothing and shelter (as in, from the weather) rank highest. Put in the context of social media, it appears that Maslow predicted the popularity of Pinterest, which makes an art form out of food, clothing and shelter visuals. Those common-denominator subjects are ones on which anyone can comment, increasing your chances of engagement exponentially. 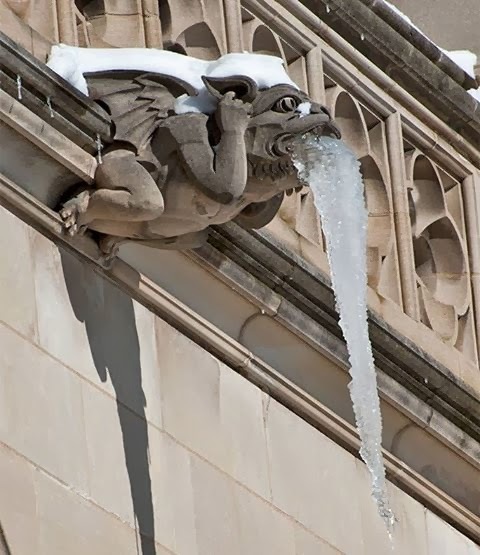 Icicle-breath: The Washington National Cathedral shared the photo above of an ice-spewing gargoyle, an image that got handed around Facebook and Twitter recently. Kinda says it all about our weather in the nation's capital. But the cathedral, now raising funds for needed repairs to its structure due to earthquake damage, is wise to be featuring and building community around its architecture. Snow visitors: Fox Chase Cancer Center in Philadelphia encouraged staff members to share pictures of its campus in the snow, later expanding the request to visitors. The contest takes advantage of timeliness, that topic we all like to discuss the most (the weather), and in the process, shows off the beauty of its surroundings. Cool campus: St. Lawrence University in far upstate New York is indisputably cold and snowy this time of year. Its Instagram account encourages students, faculty and others to share photos of the lovely campus in all seasons, and reposts the album here on Facebook. And it makes good use of its Facebook page cover photo to share wintertime shots of campus. Wild winter: The National Wildlife Federation has an ongoing campaign to get kids and adults outdoors. Its "Explore and Get Outdoors" board on Pinterest is now pinning winter hiking, snow sculpting and winter outdoor fitness ideas, keeping its outdoor board fresh even in freezing weather months. Got a seasonally themed photo series on one of your social sites? Let us know about it in the comments, even if you did just change it this morning.